Student Perspective: Midterms Are Over! Amanda is a junior psychoogy student at SDSU. 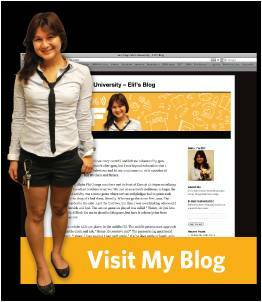 She and three others write their own blogs chronicling the life of an SDSU student. Following is Amanda’s latest entry. Whew! These past 2 weeks or so were just jam packed with tests, quizzes and papers! But that process never ends when you’re a student, huh? Finally the weeks are smoothing out, and I’ll finally be able to sleep normal hours and I won’t be stressing out so much. This semester I have finally learned that 18 units…is possible..just really stressful… haha! But that really depends on the person. Just for me personally, 18 units seems like a lot. However, it also depends on your teachers, how well you do in the class, study time, extracurriculars etc. So I mean, if I didn’t have all the things that I have on my plate, I don’t think I’d be as stressed out as I was. So usually on my breaks between classes, I like to go in the library and find cushy chairs. This is one of the best accommodations here at SDSU. Although you gotta compete against a lot of other people for these chairs, and if you plan on going on your laptop (and it’s like mine and hates being unplugged) it’ll be a little harder to find an outlet next to a comfy chair. I mean other than the competition and trying to find a plug, not to mention the amount of students there are during midterms/finals, finding a chair isn’t too hard. There are a lot of students that are usually sleeping on these chairs (sometimes I’m one of them! ), but they’re really comfortable! Elif is a fourth-year Accounting major at SDSU. 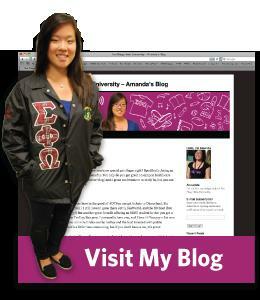 She and three others write their own blogs chronicling the life of an SDSU student. Following is Elif’s latest entry. In Accounting 321, the professors were encouraging all the students attend the Meet the Firms Workshop held by Career Services. The incentive was getting a higher grade in the tax portion of the class. When I got to the room, there was at least 80 people there. Talk about squished. Note: if your professor offers extra credit by going to a workshop, get there early. Before I start, Meet the Firms is a networking event where you meet people who can potentially offer you an internship, summer or full-time job, and an opportunity to build experience. This event is popular for Accounting majors because we all want to grow up and be successful. In addition, the people you meet at Meet the Firms do provide you valuable information about the field and can give Accounting students advice about their major. Your objective statement in your resume can either make you or break you. The presenter did suggest that you do leave it out of your resume. When applying for a job, please follow the instructions on the application. If they request certain information, please provide it. When putting your volunteer experience, it is strongly suggest that one does not put any political or religious affiliations. You might be an Democrat, but the person interviewing you might be a Republican. Do Not Lie. Human Resources does their Homework. They will look into your transcripts, prior work experience, etc. There is something called a stupid question. Press your clothes before an Interview or Networking event. Others will notice the wrinkles on your attire. Remember to Dress for Success. Everyone is shy when they go to a networking event. Make a goal that you will talk to at least 2-3 people at the event. I found the information very valuable. In addition, the presenter stayed and answered some of my personal questions. Career Services definatley scored bonus points for the Accounting Students. The beginning of October marks the start of an exciting time in the SDSU Admissions Office. It’s another year of hopeful applicants, excited parents, and an influx of questions about everything from majors to athletics to meal plans. As an applicant, you are likely overwhelmed with questions about SDSU, our application process, and what you need to be doing to make sure you are on the road to becoming an Aztec. Last fall we shared some great tips for getting your questions answered and this fall we’ve implemented even more ways to make sure all the info you need is only a click away. Our newest video answers questions about applying to SDSU, featuring current students and staff who give you a peek into our office. We’ve tackled nine of the most commonly asked questions from prospective students. These questions came straight from you via our e-mail inbox, Twitter profile, and Facebook page, so thanks for the help! A new revamp of our mySDSU page also allows students to receive personalized communication based on major interest and school year. Students as young as middle school can start interacting with SDSU and paving their way to becoming SDSU Aztecs. Sign up for your personalized mySDSU page to get connected. Today, information is no longer one sided. At SDSU, we pride ourselves on technology that is more about engagement and interaction than simple information presentation. Join the conversation on Twitter, write on our Facebook wall, or leave us a comment on YouTube. We know you have a lot of questions, and we’re listening. It’s truly amazing what SDSU has to offer students. I’m just starting my last semester at State and over the last three years I’ve come across an endless amount of opportunities. With everything this campus offers, it is not a matter of finding open doors, it’s about narrowing down which one you want to walk through. Jumping on board with the University Honors Program freshman year landed me a job I still love. Last fall opening e-mails from my major’s department led me to a spring break in Argentina. And this summer an announcement on the Centre for Integrated Marketing Communication’s (IMC) Web site allowed me to spend a week on the East Coast learning and collaborating with 30 students from across the country. This August, I participated in the DMEF’s I-MIX program. The DMEF’s mission is to attract, educate and place top college students in the interactive marketing field. 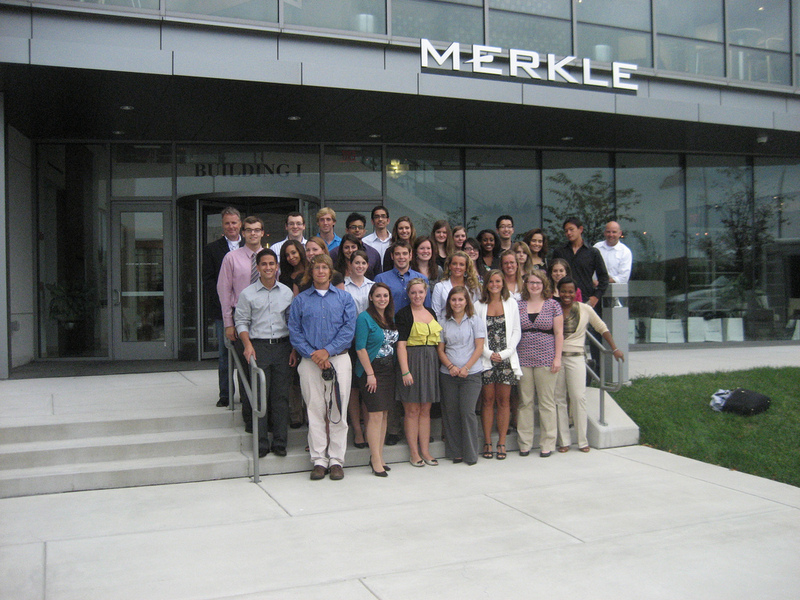 I-MIX, one of the DMEF’s many student education experiences, offers 30 students from different colleges a chance to learn from industry professionals during a week-long trip to Columbia, MD. I showed up to the program not only proud to be a Californian, a marketing major, and soon-to-be graduate, but I was most proud to be an Aztec. Without the Centre for IMC I would have never known about the opportunity. Without SDSU classroom experience in hands-on learning, I would have never been so comfortable presenting ideas in front of top management executives. And without a truly effective degree program structure, I would have never felt so prepared among a group of top students earning the same degree. I was happy to represent San Diego State and confidently say that more SDSU students will make it into the program next year. Every department at SDSU has opportunities for students to take a proactive step in their education. College isn’t another four years of classes; this is the time to learn and do what you love. Find your passion and run with it. Volunteer with a professor on a research project, join a professional organization to start networking, or simply keep up on university news, e-mail, and Web announcements. At SDSU, one connection can spin a web of opportunities to grab hold of. Never be afraid to ask questions, reach out, and go for what you want. You’ll be surprised at the response you receive. It’s truly a great day to be an Aztec, take advantage of it. After a few months of effort, we are pleased to release the SDSU iPhone and Smartphone application for our campus. Working with Jamieson Johnson and Kushyar Kasraie of EZ Axess, Inc. we spent the summer designing SDSU Mobile. Our initial release allows you to view SDSU videos, news, current events as well as find contact information for faculty and staff, or locate points of interest on our campus. We had fun designing this application, which uses the Internet in real time to provide you with the latest information on SDSU, including this year’s Aztec Nights! This application utilizes ‘channels’ which offers design flexibility as well as allows the user to easily access information of particular interest. 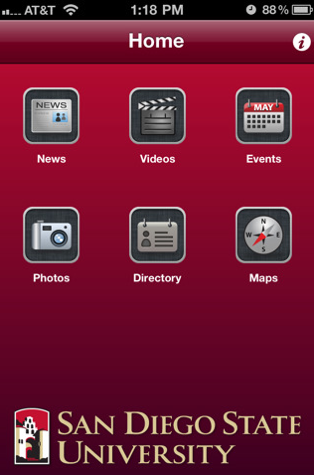 This free Apple iPhone application can easily be found on the Apple iTunes Store, by searching for SDSU Mobile. 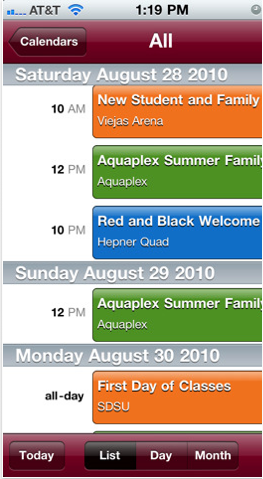 To maximize access, we also designed a companion version that will work on virtually all mobile smartphones. To utilize this version, navigate to SDSU Mobile using your phone’s web browser. In fact, any web browser can use this same method to access the information. We hope you enjoy this new application and we will keep you posted as we add new features! This past week has been one of the more interesting and challenging during my time working here on the Mesa. Best laid plans, and all that. Last Thursday we were supposed to roll out our announcement that President Weber was retiring. An email to campus would be sent in the morning, followed by his speech at Convocation, followed by a press conference. Nice and easy. A last minute logistical snafu pushed the announcement up to Tuesday. Ok, roll with it. Monday night, a water main broke, shooting a geyser into the air, and shutting down air conditioning in most of the buildings on campus — during the warmest week of the year. All the media in town came out in the middle of the night, and on into the late morning, to cover the water main break. President Weber’s announcement was now fighting for time with the weather. Fortunately, we’ve got an entire school year to talk about his many accomplishments at SDSU. Throughout the week, many on campus went home early. The media team and others stuck it out with the use of fans – and frozen yogurt. The top story for the week continued to be the broken water main and air conditioning, which was finally fixed Saturday. All this took place while new students moved in on Friday, and Welcome Week activities continued through the weekend as planned. This morning, all the TV stations in town came to campus to help us welcome students back for their first day of the semester. We juggled the dance team, cheerleaders and others back and forth between them. And President Weber did a handful of interviews, including appearing on KPBS’ These Days. As PR folk, this is kind of what we live for. And as university folk, seeing the excitement of the students on the first day of classes is kind of what we live for as well. Despite it all, it’s a good time to be an Aztec. And if this past week was any indication, we’re in for an exciting year.